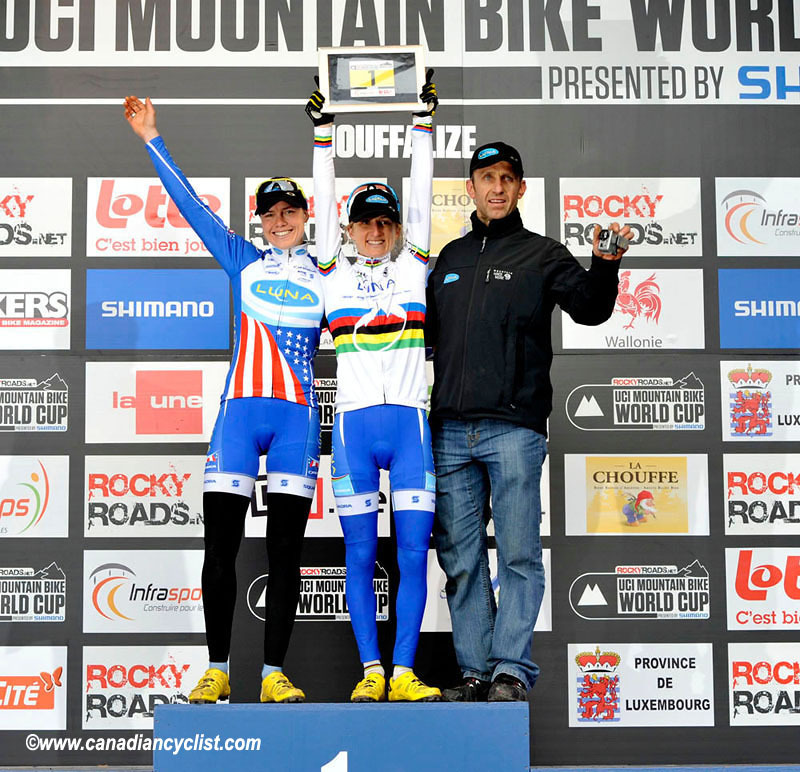 In 1992 Canadian mtn bike legend Alison Sydor won the Houffalize World Cup. One of many times in her storied career that she would set the bar high for Canadian women. 20 years later, that same honour was being presented to me. 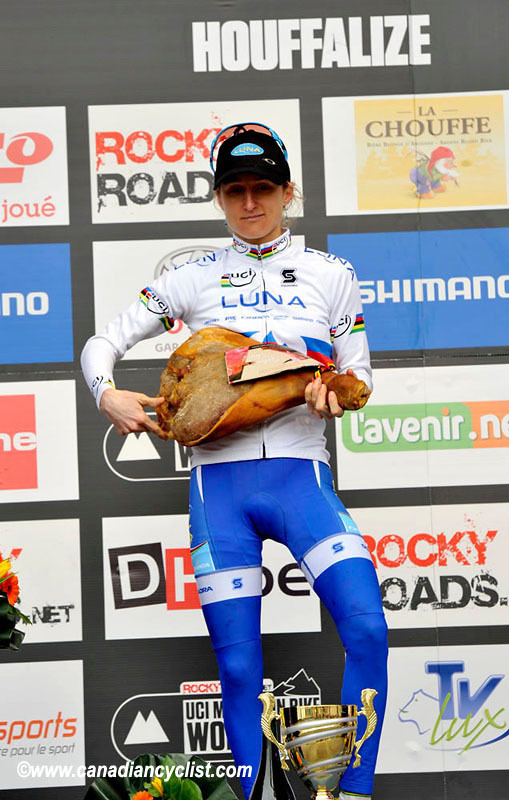 Houffalize has always been a special event. Before I ever raced there myself I had watched the documentary “Off Road To Athens” and wondered what it would be like to race such an historic classic. Not only was it known for it’s steep descents and steep cobbled climbs that raced you through the small Belgian town of 5000 people, but it was known for it’s huge spectator turn-out, fresh course-side waffles and La chouffe beer. Hot waffles and beer always make for enthusiastic spectators. Houffalize was the first World Cup I raced as part of the Luna Team, earning myself the nick name “John Deere” as I surprised myself by racing into 2nd position early in the race, leading a group of World Champions (Gunn-Rita Dahle and Irina Kalentieva) and 2 of the most experienced women in the race only to not-surprisingly bonk spectacularly and navigate my way through stars back to the finish line. But what an amazing thrill! 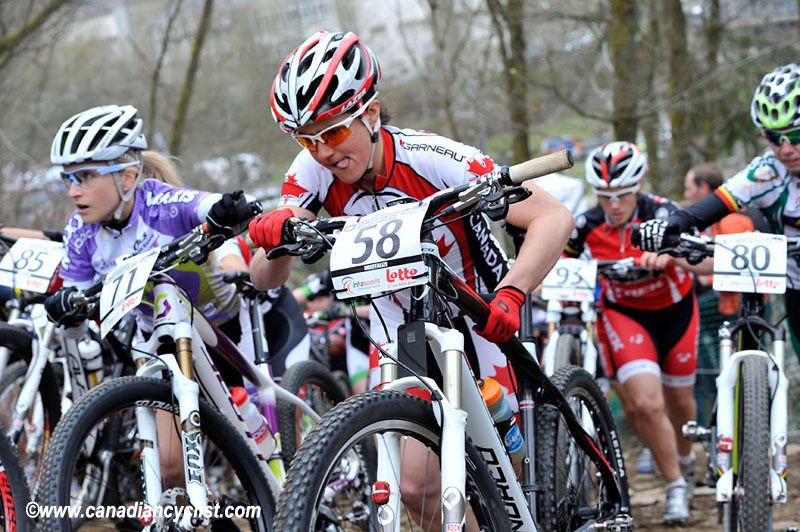 I have definitely become a more experienced racer since my first experience in Houffalize in 2008, but the thrill of racing a tough course with good legs, climbs lined with spectators and the smell of freshly baked waffles is still the same. Team Canada’s Olympic hopefuls were also all top 15 in the women’s race with Emily Batty finishing 7th and Marie Helene Premont 14th. Geoff Kabush rode an impressive 11th on the day. Fudge and Viper navigating the start traffic on a killer opening climb. Look for me in white and black rather than rainbows at the next world cup as I don the World Cup leader’s jersey!